CAA @ Burlington Toyota Dealer ON. Thousands of Canadian motorists respond each year to the Vehicle Durability Survey conducted by the Canadian Automobile Association (CAA). Starting in 1983, the manufacturer of the model that has fared the best in each year's survey is presented with the CAA Used Car Performance Award. 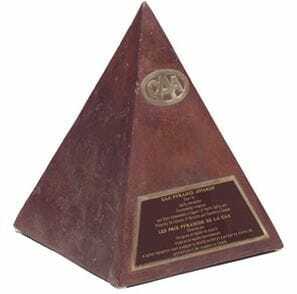 The pyramid shape of the trophy symbolises engineering excellence and durability. The winner is determined by the high percentage of owners who would buy the same vehicle again (if allowed to go back in time and knowing at the time of purchase what they know now), the high percentage of very satisfied owners, and the low cost and frequency of repair. These figures are calculated from data from responses on the three model years preceding the year of the survey. The number of times Toyota has won the award, in the CAA's words, "establishes this manufacturer as the benchmark against which to measure owner satisfaction."